July is a special month for me, as the first day of July is my birthday~ I am 25 years old now. Time flies, quarter a century old already. I have learnt a lot as well being abroad and living by my own since I finished high school. We cant always have what we want but work hard towards to achieve what you want in life. People may think I am crazy/spoilt/whatever when I buy bags and such, but, hey, I work hard and i deserve to pamper myself from time to time. July Empties!!! 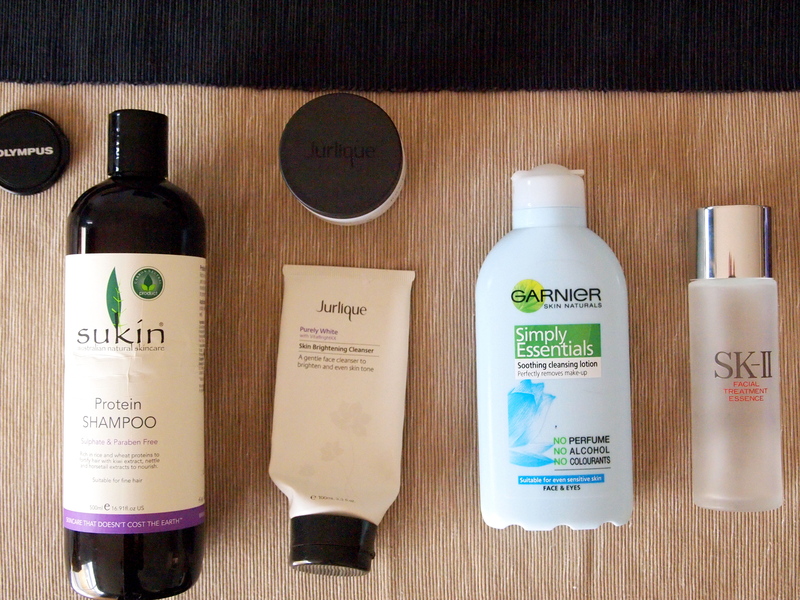 Woohoo~ Empties mean new products to try/experiment. 1) Sukin Protein Shampoo: First of all, I have fine and limp hair and that makes managing my hair hard. I have been using organic shampoo for 2 months now and I really like it. reasons being it is organic, no sulphate and paraben, no synthetic fragrances, no animal derivatives, no artificial colours, no mineral oils, no EDTA, most importantly, it is Australian owned and made, 100% Vegan and 100% carbon neutral. I refused to use shampoo that contains SLS and their derivatives. The down side to it is no bubbles will form and you do not get that squeaky clean feeling, but, the good thing about it is your scalp wont get oily that fast. Will I repurchase it? Yes I will, the product is affordable and I cannot find anything better for its value. 2) Jurlique’s Purely White with VitaBrightKX skin brightening Cleanser. Most of you should have known by now that I love Jurlique and I am a huge fan of Jurlique. I have used most of their cleansers. I like it in the sense that it does not dry my skin like other cleansers I have used in the past, however, in terms of whitening, I havent seen any improvement in terms of brightening and my face is still dull, it may due to myself not using sunscreen. Basically, this cleanser helps minimise the visible appearance of dark spots and discolourations and improve skin radiance. Natural mineral exfoliants help to gently remove makeup, surface dirt and impurities. Will i repurchase it? No I dont think so, but I will repurchase their Rose hydrating one. 3) Jurlique’s Herbal Recovery Night Cream. I personally think night cream is very important in maintaining good skin, our skin repairs itself during night time, so make sure you use a good night cream and get enough sleep. I bought this night cream when it was first launched, I started using it a few months ago and I really like it. it contains nourishing antioxidant, contains a few botanical extracts like Moth bean extracts to refine our texture and enhance radiant. African Birch Extract to increase firmness. Kakadu Plum extract to improve skin tone and discolouration. I love it as it is a all rounder, hydration and whitening/improve in skintone is what I really need. It is not a rich cream type. I apply a pea size onto my face at night and wake up feeling awesome in the morning and most importantly, my face wont get oily in the morning. Will i repurchase it? Yes I will. 4) Garnier Cleansing lotion. I personally prefers cleansing oil but, there are times when I change my mind. Cleansing milk is actually not that bad. I love the fact that it can be used on face and eyes as well, most importantly, it does not contains perfume, alcohol and colourant. There are times when my skin feels so dry after using certain cleansing oil. I always double clean it and I normally use Clarisonic to clean my face with my normal cleanser. Will i repurchase this? YES I WILL, this is in fact my second bottle. 5) SK II Facial Treatment Essence, no introduction needed, please read my earlier post on this particular product.